A Bardstown resident, Mrs. Wanda C. Blandford, age 80, passed away Friday, November 23, 2018 at the University of Louisville Hospital. She was born on May 28, 1938 in Raywick to the late Charles and Catherine Thompson Miles. 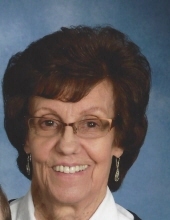 Wanda was a homemaker, a member of St. Joseph Catholic Church, she had worked in St. Joseph Cafeteria, sang in the choir and was formerly the head of the Bereavement Committee. Besides her parents she was preceded in death by a sister, Sharon Miles, 3 brothers, Jimmy Miles, Melvin Miles and Raymond Miles. She is survived by her husband John C. Blandford, 2 sons, Keith (Annette) Blandford of Bardstown, Mark (Debbie Smith) Blandford of Bardstown, 2 sisters, JoAnn(Bobby) Thomas of Loretto, Georgia Miles, Lebanon, 4 brothers, Charles Miles and Marvin (Elanie) Miles both of Fern Creek, Richard (Patsy) Miles of Bardstown, David (Peggy) Miles of Mt. Washington. Wanda is also survived by 5 grandchildren and 3 great grandchildren. Mass of Christian Burial will be 11:00am Wednesday, November 28, 2018 at the Basilica of St. Joseph Proto-Cathedral with Reverend Terry Bradshaw celebrant. Visitation will be Tuesday, November 27th from 3:00-8:00pm with evening prayers and after 8:30am Wednesday at Houghlin Greenwell Funeral Home, 1475 New Shepherdsville Road, is in charge of arrangements. The family request that expressions of sympathy take the form of contributions to St. Joseph Bereavement Committee or St. Joseph Cemetery. To send flowers or a remembrance gift to the family of Wanda Catherine Blandford, please visit our Tribute Store. "Email Address" would like to share the life celebration of Wanda Catherine Blandford. Click on the "link" to go to share a favorite memory or leave a condolence message for the family.